While antigovernment extremist organizations like the Oath Keepers targeted the Black Lives Matter Movement and announced solidarity with law enforcement officers, especially those who make up its ranks, the most extreme response came from the racist right –– from neo-Confederates to National Socialists. “As freemen and citizens, we in The League will arm ourselves, defend public order and property, and stand beside our brothers and sisters in the peace keeping profession,” said Michael Hill, president of the neo-Confederate and increasingly anti-Semitic League of the South. Hill was not alone in reading the circumstances behind the shooting in Dallas as the opening volley in a race war. On Stormfront, the largest white supremacist website, one user wrote: “Well, if they keep this **** up then, yeah, there will be a war.” Another anonymous Stormfront poster using the name: “Kriegsberichter-NZ,” was more blunt. 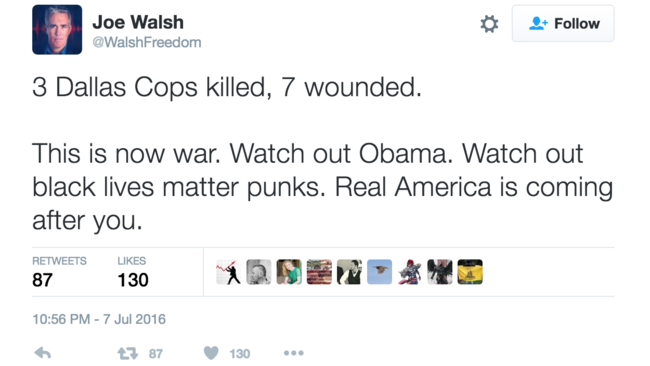 “Race war is here,” he said. The domestic terrorist attack in Dallas, which left seven officers injured in addition to the fallen, happened during a scheduled peaceful protest to bring attention to instances of police violence that left two black men dead –– first in Baton Rouge, La., and then in St. Paul, Minn. But the reaction from white extremists also comes in the aftermath of dozens of other domestic terrorist attacks in recent years where the offenders were white, and the targets were historically maligned populations of the American cultural landscape. The racist right is fascinated –– even enamored at times –– with a coming race war, the perennial subject of racist books like The Turner Diaries, which inspired Oklahoma City Bomber Timothy McVeigh. “The center cannot and will not hold,” wrote Matt Parrott, co-founder of the Traditionalist Youth Network and the Traditionalist Worker Party, groups that were at the center of a bloody melee that erupted during a protest in Sacramento that left several people stabbed and wounded. “Probably not tomorrow, most likely not in the coming year, but soon, sooner than we’re ready (not that one can ever truly be ready), race war is coming to America,” Parrott wrote. On Friday, police identified the shooter as Micah Xavier Johnson, a 25-year-old decorated U.S. army veteran. Johnson was wearing body armor and armed with an SKS semi-automatic assault rifle and a handgun during the attack. The police killed Johnson by detonating a bomb with a robot after Johnson refused to surrender. During negotiations with law enforcement before he was killed, Johnson gave some indication of his motives. “He said he was upset about the recent police shootings," said Dallas Police Chief David O. Brown during a news conference on Friday. "The suspect said he was upset at white people. The suspect stated he wanted to kill white people, especially white officers." Johnson also liked a number of black separatist hate groups on his Facebook account including the New Black Panther Party (NBPP), the Nation of Islam and the Black Riders Liberation Party. Such groups typically oppose integration, are strongly anti-white and anti-Semitic and a number of them believe in racist religious interpretations, such as black people are the Biblical “chosen people” of God. While patently racist, black separatist groups are viewed in the context of organized hate as an overreaction to years of systematic white-on-black racism, as online responses to the news of the shootings put on clear display. Writing on VK, a Russian version of Facebook, one user named Mairi Macleod-Fraser, echoed the calls for a race war and said the time to had come to draw a line and chose sides.